In seeking to enhance governmental transparency and accountability constructive engagement with public officials works much better than denouncing malpractice and confronting public officials, argues the author. Project experiences in Cameroon highlight the roles of champions – a person, or a group of people in official positions – who believe that ethical behavior is in the best interest of society at large. Once these champions are in place and committed, they vastly improve the likelihood of success of any anti-corruption effort. 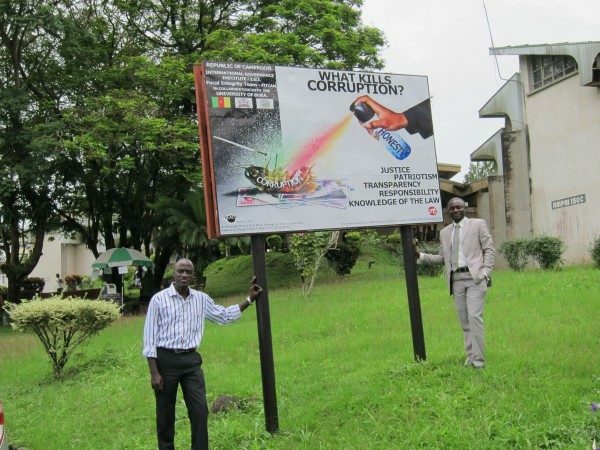 The first thing that jumps to the eye when entering the University of Buea (UB) campus in Cameroon – the welcome mat so to speak – consists of a huge billboard, that reads « What Kills Corruption? » As seen in the picture, there is no mercy at UB for the « bug » of corruption. Both Dr Lyonga and Professor Ngoh, two UB anti-corruption champions who are introduced in this story, have found the billboards on campus very effective. They told us that « The message weighs on the conscience ». Furthermore, it shows faculty, staff, students, and visitors, that the university leadership is serious about the subject. This has not always been the case, however, as clarified below. Most successful Partnership for Transparency Fund (PTF) projects have several features in common. For instance, from more than 200 PTF-supported projects we have learned that constructive engagement with public officials works much better than denouncing malpractice and confronting public officials. However, constructive engagement does not come about automatically, since it is based on mutual trust and commitment to a common goal of avoiding waste of financial and other resources. Rather, truly constructive engagement requires the active support and advocacy of a champion – a person, or a group of people – who believe that ethical behavior is in the best interest of society at large, and that reducing corruption is a prerequisite for poverty reduction and development. Once these champions are in place and committed, they vastly improve the likelihood of success of any anti-corruption effort. It is noteworthy that these champions will support anti-corruption activities even if doing so is not directly to their own advantage, and may in fact be dangerous and threatening to their own security. What then is their motivation to advocate ethical behavior and actively promote transparent and open financial and other systems? My recent trip to Cameroon to carry out a number of Project Completion Assessments with fellow PTF Adviser Adriana De Leva provided a unique opportunity to meet with several of these inspiring champions and to find out first-hand why and how they have become pioneers in a country that consistently scores in the lowest 25th percentile of the Transparency International Corruption Perception index. There is a long line of people waiting in the reception area that leads to Dr. Lyonga’s room, but she asks not to be disturbed for the coming hour. She waves apologetically to the other visitors, telling them that she needs to talk about her life’s mission of « Making the University a better place ». Dr Lyonga has recently been promoted to Vice Chancellor of Buea University. With her confirmation at this position, anti-corruption activities that had begun earlier at UB with support from PTF have significantly accelerated. Dr. Lyonga strives to make the entire UB environment free of corruption. She wants ethical behavior to become « second nature » as she calls it, for UB faculty, staff and students alike. According to her, being free of corruption is a way of being that permeates all of one’s actions : « Fighting corruption, that is my life » she says. Dr Lyonga is not alone in her conviction that the University needs to clean up its act in order to achieve its full potential as the premier university of Cameroon that it has the ambition to be. She has a kindred soul in co-worker and colleague, Professor Victor Julius Ngoh, who is UB’s Deputy Vice Chancellor for Research, Cooperation, and Relations with the Business World. Asked what he thinks the most important lessons of the UB anti-corruption activities are for PTF, he tells us that getting rid of corruption is a long-term, cumulative process, and he emphasizes the fact that the first anti-corruption workshop under UB auspices was held off-campus, to divert attention from the implication that there would be corruption at UB. Nevertheless, only two years later, a second workshop was held with quite a bit of fanfare on campus, with UB students going into the streets to hand out fliers to passers-by in order to raise awareness on the negative effects of corruption on daily life. The move of the workshop to the campus was a significant sign of progress. It signalled the beginning in earnest of far-reaching anti-corruption activities at UB. For long-term success, Professor Ngoh insists that to change a culture of corruption, one should thoroughly know the culture of the community, and sometimes specific points should not be pushed too far too fast. All we can say after our visit to Cameroon is, that we are in awe of the champions we met. As both Dr Lyonga, Professor Ngoh, and champions in other projects we visited emphasized, the presence of dedicated persons is crucial, because they vastly improve the results of any anti-corruption initiative. These champions are rising above their personal interest, simply because they are genuinely convinced that this is the right and just thing to do.